Leading UK full-service energy-efficiency specialist SaveMoneyCutCarbon.com today announces a new partnership as Master Distributor for Soraa and its revolutionary GaN on GaN technology, providing a superior alternative to halogen MR16 lamps. Soraa LED lamps are perfect for high-end retail, jewellers, art galleries, museums and the hospitality industry. For spotlighting over products, Soraa’s 95 Colour Render Index (CRI) GaN on GaN technology shows a true representation of colours with crisp shadows and exquisite detail. 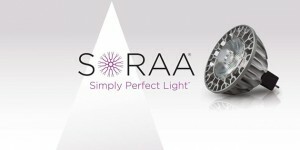 Soraa, with headquarters in California, was founded six years ago by multiple Nobel Prize nominee Dr. Shuji Nakamura, inventor of the blue LED. Soraa’s LED lamps use Gallium Nitride (GaN) epitaxial layers on a native GaN substrate, rather than the standard GaN on sapphire or silicon carbide substrates. GaN on GaN LEDs produce more light per area of LED and are more cost-effective than technology based on other “non-native” substrates. Soraa’s full visible spectrum light delivers unprecedented colour rendering that surpasses even halogen sources. Soraa’s LED lamps run cooler and have no IR or UV radiation, reducing heat and emissions that can compromise sensitive materials. offer a perfectly controlled true point source beam. have 14, 25 and 36 degree beam angles.